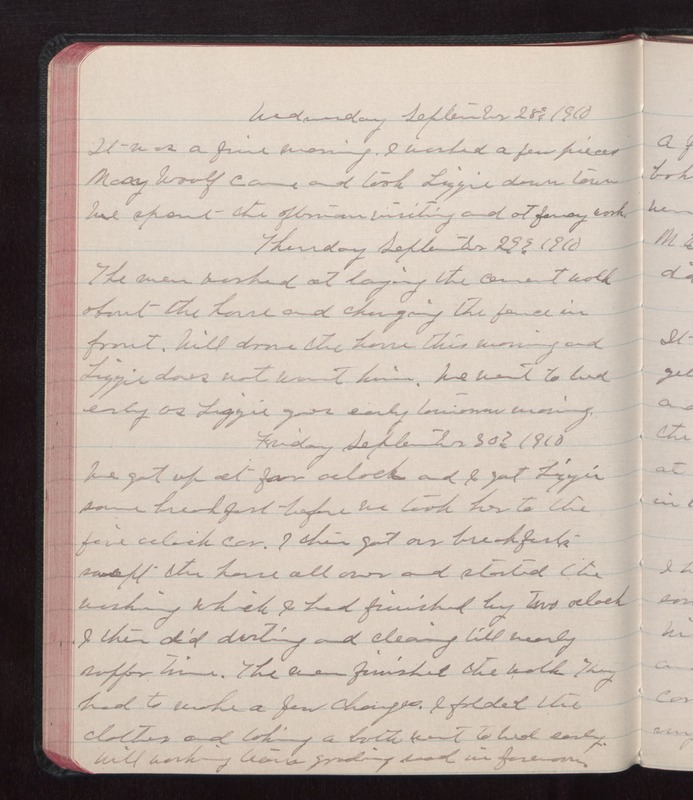 Wednesday September 28 1910 It was a fine morning. I washed a fiew pieces Mary Woolf came and took Lizzie down town We spent the afternoon visiting and at fancy work. Thursday September 29 1910 The men worked at laying the cement walk about the house and changing the fend in front. Will drove the horse this morning and Lizzie does not want him. We went to bed early as Lizzie goes early tomorrow morning. Friday September 30 1910 We got up at four oclock and I got Lizzie some breakfast before we took her to the five oclock car. I then got our breakfasts swept the house all over and started this washing which I had finished by two oclock I then did dusting and cleaning till nearly supper time. The men finished the walk They had to make a few changes. I folded the clothes and taking a bath went to bed early. Will working [illegible] grading road in forenoon.